These beautiful slip-on sandals by Sempre Di have a squishy and soft footbed to make sure that every step is a comfortable one. 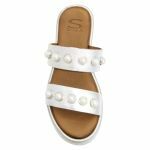 The round pearls on the straps accentuate the uniqueness of this sandal and make it a stand out for sure! 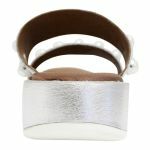 Never compromise your comfort and slide a pair of these on today!